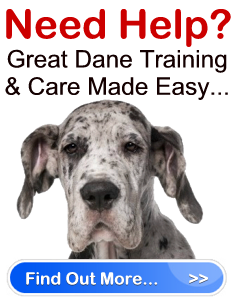 Great Dane Rescue & Sponsorship " "
A Great Dane rescue is a place where unwanted, abandoned or abused Danes are taken. The Great Danes at these rescues range in different ages, and may have different temperaments. That being said, they all have one thing in common: They are all looking for a loving family and a place they can call home. It is both fortunate and unfortunate that rescue organizations exist. You can help put a stop to the need for Great Dane rescues by not buying dogs from corrupt breeders, and by being a responsible owner. On the other hand, you can also help a Great Dane rescue by providing them your support by adopting, making a donation, or by sponsoring a Dane. Although you may love Great Danes, you may not have a lifestyle that is conducive to owning one. Therefore, if it is your wish to help a Great Dane rescue, you should consider sponsoring one. Does it cost money to sponsor a dog? Yes. However, it is entirely up to you how much money you donate in the dog’s name. You can put money towards your sponsorship whenever you desire. Can I choose what dog I want to sponsor at the Great Dane rescue? Usually yes. All dogs at a rescue require some form of support from outsiders, whether it is though foster care, donations, sponsorship or adoption. Will I be the only sponsor to my dog? Not necessarily. A dog may have more than one sponsor. Can I sponsor a Dane for someone else as a gift? What happens when I sponsor a dog? It depends on the Great Dane rescue. Most rescues will send you a thank you and provide you with information about the dog, as well as updates on the dog’s condition, and how your sponsorship has made a difference. The updates a rescue sends are normally sent via email, and are usually only sent out a few times a year. Most rescues will use the money sponsors send to help all of the dogs in their care, including the dog you’ve sponsored. The money donation goes toward purchasing dog food, medical care and training. When all is said and done, you’ll find sponsoring a Great Dane from a Great Dane rescue is a beautiful gesture that will warm your heart.